What do vascular surgeons do? 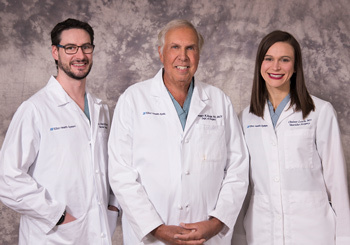 Vascular surgeons are specialists who are highly trained to treat diseases of the vascular system. Your blood vessels --arteries carrying oxygen-rich blood and veins carrying blood back to the heart -- are the roadways of your circulatory system. Without smoothly flowing blood, your body cannot function. Conditions such as hardening of the arteries can create “traffic jams” in your circulatory system, obstructing the flow of blood to any part of the body. A vascular surgeon does far more than surgery. A vascular surgeon is able to do every kind of procedure. Some specialists specialize in one or two kinds of vascular interventions, so their patients tend to get those treatments. Vascular surgeons are trained in everything: open, complicated surgery and in minimally invasive, endovascular procedures. Some patients need one, some need the other, while many need no surgery at all. Vascular surgeons are “treatment agnostic,” that is, they don’t prefer any kind of treatment over another. Patients can be assured they will get the best treatment for their particular need. Vascular surgeons manage veins and arteries in every part of the body except the brain and the heart. For example, vascular surgeons handle blocked carotid arteries in the neck. They treat the problems of the aorta (a large main artery) after it leaves the heart and enters the abdomen. Peripheral vascular disease, which often affects the arteries in the legs and feet, is also treated by a vascular surgeon. How do I know I need to see a vascular surgeon? Typically, patients are referred to a vascular surgeon by their primary care physician. Sometimes patients become acquainted with a vascular surgeon after an unexpected event lands them in the hospital. You might be referred to a vascular surgeon if you see your regular doctor for pain in your legs, and learn that you have peripheral arterial disease, for example. If you are in a high risk category: are a smoker, diabetic, and/or have high blood pressure, you may be a candidate for starting a relationship with a vascular surgeon.